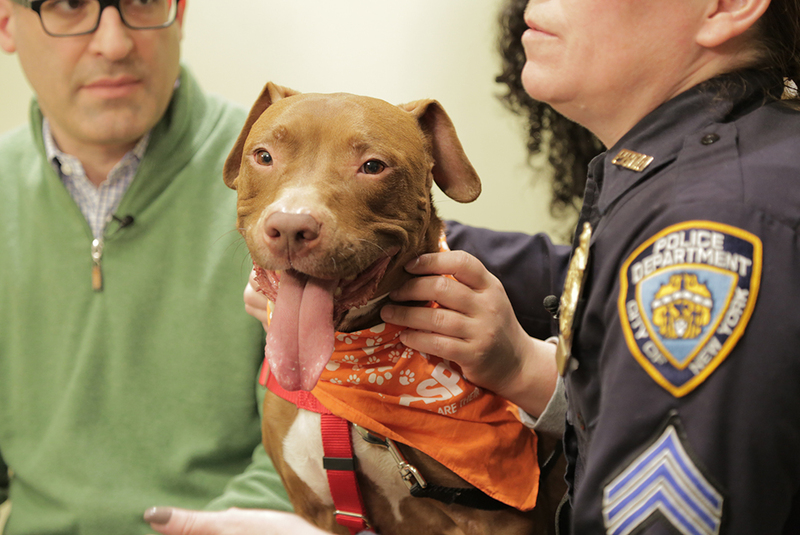 Once rescued by the NYPD, adoptable dog Orson, is now featured in their latest video series. Would you know what to do if you saw animal cruelty happening? 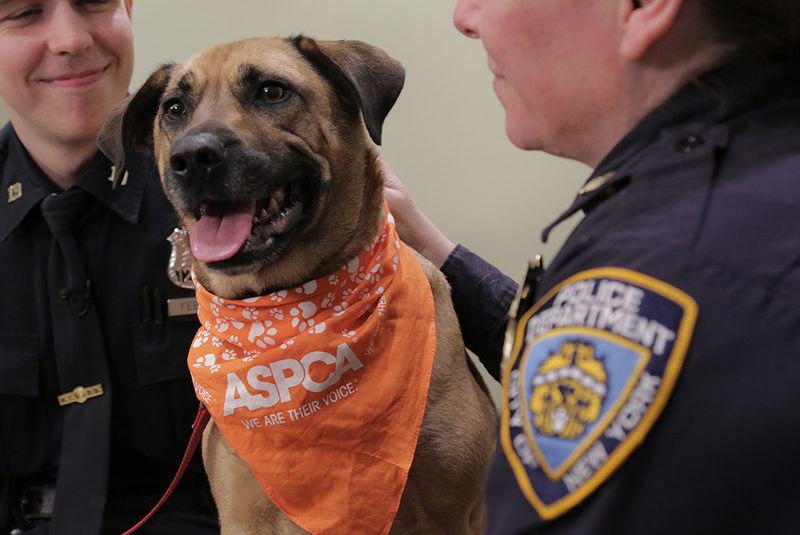 The ASPCA and the NYPD want to make sure you can confidently answer “yes,” to that question. That’s why we are launching a new series of social media videos to encourage New Yorkers to report animal cruelty throughout the city’s five boroughs. The videos feature NYPD officers and rescued animals and will cover several topics—from the importance of reporting animal cruelty, to dog fighting and adoption. All of the shareable videos will emphasize how New Yorkers can help protect the city’s animals and do their part to prevent and report animal cruelty. Some of the animals featured in the videos have dramatic rescue stories, like Fraggle, an NYPD rescue who was found inside a sealed suitcase, near death, in the Bronx. A call to the NYPD saved his life, and after months of medical care from the ASPCA, the fortunate dog ultimately found a safe and loving home. Fraggle is all smiles now as he poses with an NYPD officer and ASPCA President & CEO, Matt Bershadker. The videos will be released on the NYPD’s social media channels throughout April as part of Prevention of Cruelty to Animals Month, a time when we encourage animal lovers and supporters across the country to raise awareness about important issues facing animals and fight back against animal cruelty. 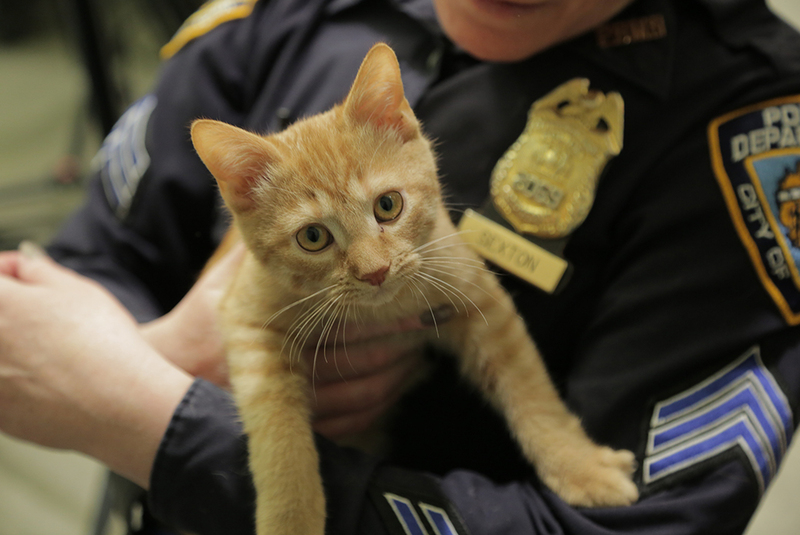 In this important partnership, the NYPD takes the lead role in responding to all animal cruelty complaints in the five boroughs, and the ASPCA provides direct care for animal victims, as well as training and veterinary forensic and legal support for the NYPD. The success of this five-year partnership with the NYPD also relies on the public’s participation for it to have the greatest life-saving potential. That’s why it’s important to know how to spot the signs of cruelty, and when and how to report it. To report animal cruelty in any of the five boroughs, the public is encouraged to call 311 or submit an online complaint. For crimes in progress, individuals should always call 911. See the first video featuring Matt Bershadker and Fraggle below!